Tool-Rank is happy to be able to team up with DeWalt to giveaway away a brand new DeWalt Pneumatic Nailer. Best of all, the winner gets to choose which nailer they will receive. If you do a lot of general construction, the DeWalt 21° Plastic Collated Framing Nailer (DWF83PL) might be right for you. If you see a new roofing job in your future, the DeWalt Coil Roofing Nailer (DW45RN) might be your choice. 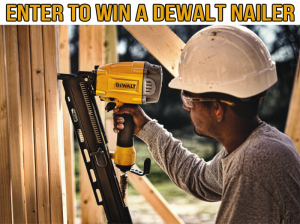 Both Nailers are being provided by DeWalt, so it would be nice if you sent them a tweet or comment letting them know that you appreciate the opportunity to win.